Hybrid solar power systems are the best of both worlds: you get the guaranteed (well, 99.9% of the time) electricity supply of the grid, with the ability to store your excess solar energy for use when the sun isn’t shining. This typically reduces your dependence on grid imports by 70% to 95%. Hybrid systems are also at least half the price of an off-grid system and don’t require diesel backup. They’re still more expensive than a purely on-grid system, though – typically double the price of grid-connect solar. The only difference between a hybrid solar power system and a regular grid-connect system is the addition of batteries and a battery inverter – see Figure 1.10. 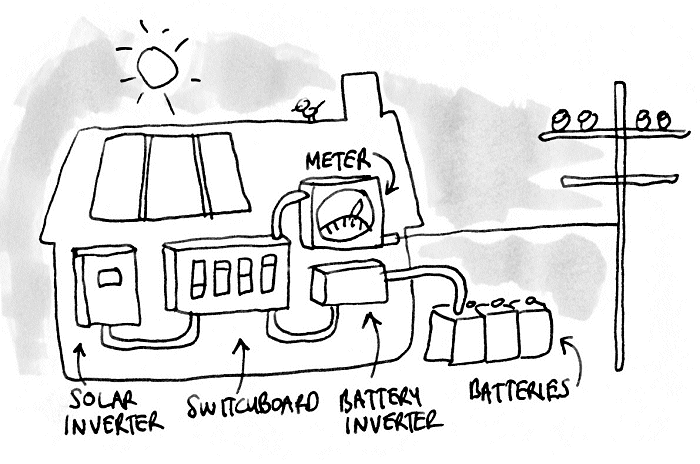 Figure 1.10 Hybrid solar system is an on-grid solar system with batteries. A hybrid system is generally configured to charge the batteries with excess solar energy – as this is the cheapest form of energy you can get. Once the batteries are full, the excess solar gets sold to the grid, earning you an income. When there is not enough solar energy to power your home, the battery inverter will do its best to provide power from the battery. If it can’t provide enough power (remember, power is measured in kW) because it hits its power rating, or it cannot provide enough energy (kWh) because it is running flat, then the grid will provide the shortfall. Generally, the batteries in hybrid solar systems are sized to get you through the night, but they can still pump out power during the day when required. Hybrid systems are configured so that your house uses solar first, then battery power, then – as a last resort – grid power. If you suffer a grid outage, some hybrid systems can provide limited backup from your batteries to keep the lights on and some appliances running. I chose my words very carefully in the previous sentence. I say ‘some’ hybrid systems because, counter-intuitively, many hybrid systems can’t provide backup power if the grid goes down. This is because running in ‘off-grid’ mode requires extra control and switching equipment, which costs at least $1,000 more. Even if you’re offered a battery that promises ‘backup’, it may not be the backup you’re expecting. I’ll explain this in detail in the battery section of Step 5. In summary, a hybrid solar system is a grid-connect solar power system with added batteries. It’s about a third of the price of an off-grid system, can sell excess solar instead of wasting it, and doesn’t need a generator. If you want batteries and you already have a grid connection (or you’re building and you can get connected to the grid for a reasonable price), hybrid is a much better option than off-grid. Short answer: If your main motivation is optimal payback or helping the environment then don’t buy batteries (yet).